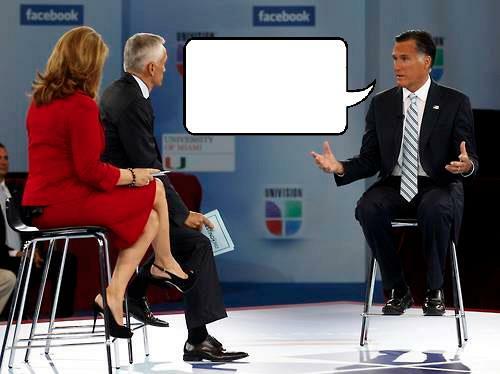 Romney's appearence on Univision's candidate forum served more to nail shut the Latino vote coffin, than anything else. There was much speculation over whether he wore "brownface;" purposeful or not, it probably wasn't the next move. We're now learning that Romney had to bus in supporters to Miami, traditionally thought to be a hub for Latino conservatism, for the Univision forum. A tall-tell sign. All this is Besides the fact that he used the term "illegal alien," called undocumented workers, "unskilled," and gave to specifics on his promise for immigration reform. MIAMI, Fla. — Mitt Romney's campaign took a hard line with the Spanish-language network Univision, making last-minute demands in the run-up to last week's town hall that helped insure his success in the forum, sources familiar with the broadcast told BuzzFeed. When the Republican took his place Wednesday night in the first of two back-to-back candidate forums televised on the mega-network, he was greeted by an adoring, raucous crowd that cheered his every word, and booed many of the moderators' questions. The next night, President Obama was treated to stone cold silence from the audience as he was aggressively grilled on his lackluster immigration record. The contrast was widely noted by observers who watched both forums — and it was glaring enough to evoke some boasting from the Romney campaign in the immediate aftermath. "These forums are going to be watched by more Hispanics than watched the conventions," said Alberto Martinez, a Florida-based Romney adviser. "I think [Romney] did an amazing job, and I think it was pretty clear there wasn't the same excitement for President Obama." But the enthusiasm gap may have been an optical illusion formed by a series of last-minute demands by the Romney campaign, according to Maria Elena Salinas, one of the Univision anchors who moderated the forums. Salinas told BuzzFeed that tickets for each forum were divided between the network, the respective campaigns, and the University of Miami (which hosted the events) — and she said both campaigns initially agreed to keep the audience comprised mostly of students, in keeping with the events' education theme. But after exhausting the few conservative groups on campus, the Romney camp realized there weren't enough sympathetic students to fill the stands on their night — so they told the network and university that if they weren't given an exemption to the students-only rule, they might have to "reschedule." The organizers relented. One Democrat with ties to the Obama campaign noted that Rudy Fernandez, the university official charged with coordinating the forums, is a member of Romney's Hispanic steering committee. Fernandez did not respond to BuzzFeed's questions about whether he gave preferential treatment to Romney's campaign. In any case, Romney's team was allowed to bus in rowdy activists from around southern Florida in order to fill the extra seats at their town hall. Obama's campaign, meanwhile, stuck to the original parameters and allowed a large chunk of the tickets to be distributed to interested students on campus. The result was a quiet, well-behaved crowd — and a lot of no-shows. Minutes before Obama's forum was to begin, producers began frantically directing university staff and volunteers to sit in the empty seats. That wouldn't be the last demand from the campaign: Romney himself almost pulled the plug on the whole thing minutes before the broadcast, Salinas said. The dueling forums served as the centerpiece of a week when both candidates were working hard to appeal to Hispanic voters. In addition to his Univision appearance, Romney sat down for an interview with Telemundo, and held an energetic "Juntos con Romney" rally here, complete with Cuban salsa music, and a cameo by the candidate's Spanish-speaking son, Craig. The Obama campaign was quick to point out that Romney spent less time on Univision than the president did, pointing to it as a symbol for the Republican's lack of commitment to Latino voters. "Mitt Romney used the limited time he gave to Univision to evade the tough questions and reiterate positions he's taken that would disproportionately impact Latinos," said Gabriela Domenzain, accusing the Republican of championing middle class tax increases and a hardline immigration policy. The Romney campaign, meanwhile, dismissed Democrats' crowing as an attempt to divert attention from Obama's rocky performance, during which he admitted to dropping the ball on immigration reform, and said he'd learned in office that "you can't change Washington from the inside." One Romney aide, who requested anonymity to discuss strategy, said their campaign received no special advantage in the forums. Instead, he said, their superior crowd was proof that their strong Hispanic outreach program in the state is working. Indeed, presidential campaigns are rarely won by the meek, and the Obama campaign's ability to provide presidential access to favored outlets is one of the cycle's most valuable resources. But the Romney camp fought harder at the critical Hispanic forum, and it appeared to pay off. Since the conventions, local Romney aides have been boasting that their Hispanic-focused ground game in the state is bigger than any Republican presidential campaign in history, with 13 full-time paid staffers and hundreds of volunteers. What's more, one person familiar with both campaigns' media buys said Romney aired Spanish-language ads in key battleground states throughout the country during the Univision forums, while the Obama campaign remained dark in Spanish markets on those nights. Romney has more work to do than Obama does in winning over the Latino electorate, with recent polls showing the president leading in that demographic nationally by as many as 50 percentage points. But the gap is much smaller among Florida Hispanics, who include a large, right-leaning Cuban exile minority, and the Romney aide said Obama did nothing to seal the deal in his Univision appearance Thursday. "This is getting into dangerous territory for Obama, because they don't just have to win Hispanics here, they have to win big," the aide said. "He just keeps giving them reasons to think he is a weak leader." From Univision's perspective, Salinas said both candidates got a fair hearing in the end. She also sough to quash a bizarre internet rumor that began circulating after the first forum asserting that Romney, whose skin looked unusually tan on camera, used makeup to look "more Latino" for the audience. "He used the same makeup person I use, and we asked her if he requested darker makeup," Salinas said. "She said, 'No he didn't request anything.' Apparently, he was just a little sunburned."